Standing atop Rattlesnake Mountain gazing down at the Baker River as it winds its way down the valley from its headwaters in Wentworth to its confluence with the Pemigewasset River in Plymouth there is a sense of peace . . . a sense of place that one feels. I seek out that summer at times like this, when the chaos in Washington and the world begins to overwhelm me. When one tweet storm after another sweeps across the country blotting out all of the other crises in need of our attention. 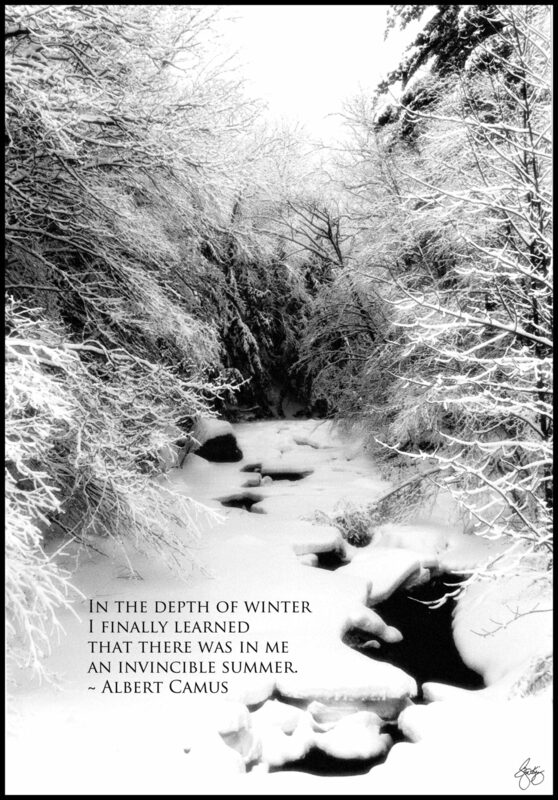 That invincible summer somehow creates the space for me to continue on. Former state Sen. Wayne King of Rumney has written ‘Sacred Trust,’ a fictionalized account of a battle to stop a powerline project. 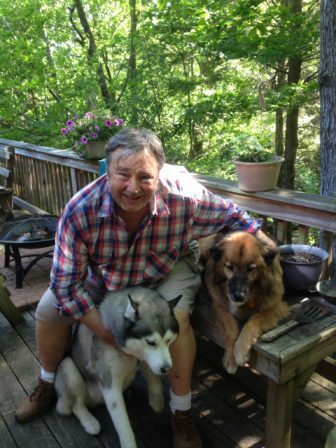 He is pictured with his dogs Anni and Boof. The most recent distractions began with a memo sandwich over the Russia imbroglio; “the Nunes Republican memo” to which the entire intelligence community had objected but was released by the President over their objections; followed by a second memo “The Democrat’s Memo” that the President just could not release because of the objections of the Department of Justice. In the middle of this memo sandwich, was The State of the Union Address – the second longest such address in American history – It wasn’t until he had finished that I realized the President had spent more than an hour telling us about all of the fantastic things he had done and never once spoken about our collective future . . . our American Journey. Call me an incurable romantic but there is something about the State of the Union Address that leads me to expect my president to tell us where he – or she – sees us going together in the future. Looking to the future together creates shared moments that encapsulate our hopes and our dreams. It even helps us to tame our fears from time to time. Yet, in over an hour of boasting and braggadociousness, Donald Trump never called on Americans to dream together; never engaged our American Voice; never sang our American Song. Yet somewhere, in the back of our minds, most Americans – including those who voted for Trump – can still hear that song. The song that we share, the bond that we share, the nexus between what we all recognize as fundamental American values and our willingness to engage one another in the journey to define a more perfect union. This has been the glue that has held us together through some of the most challenging times in our history. That is the American Voice. Now, more than ever, we are called upon to embrace those fundamental values. The American voice is being shattered into a babel-like cacophony and we must fight with everything we have to recover it. Not because The American Voice alone will save us from the crises ahead . . . it won’t . . . but because it will provide us with common ground to talk with one another and a common cause that will keep us from falling into an ever widening rabbit hole of fear and retribution driven by the political extremes in their efforts to either advance an extremist agenda or exact retribution from those advancing such an agenda. Almost every American recognizes that major changes are roiling our economy and our geopolitical world, happening at an ever increasing rate. New York Times Columnist Tom Friedman describes this as the age of accelerations. The days of the simple Command Economy vs. Market Economy are drawing to a close. The left vs. right debate no longer serves us well, if it ever did. We are a nation in search of a new paradigm. A paradigm that remains true to the central ideas and ideals of the American vision of Life, Liberty and the Pursuit of Happiness. A nation with a place for everyone: Where the working class is not marginalized; where the wealthy are not villainized; where the poor have a real pathway out of poverty, where the middle class is expanding, not shrinking; where it matters not what your skin color is or who you choose to love or what you choose to call yourself; where the opportunity for a meaningful life is recast to reflect a new set of realities and participation in the ongoing Great American Journey is an imperative. In order to define and build this new paradigm we will need to be able to speak with one voice – One American Voice – respectful of our differences, bold enough to honor the traditions of our founders, challenging the people to help define this new paradigm, crafted by evolution not revolution and built from the center out, not from the margins. In other words, like a gyroscope on a rocket that prevents over-compensating in the blink of an eye turning one odd movement into an uncontrollable series of gyrations that tear the ship apart; We need the common ground of our American Voice and shared American Values to serve as a ”governor” – moderating the reaction when the “Heat of the Moment” will tempt us toward over-reaction. We must find a way to stop screaming at one another and begin listening . . . moving our country forward. Over the next few weeks, I intend to use this column as a way to propose a series of interconnected ideas for moving beyond the current divide. Ideas for strengthening the American Voice and building a new entrepreneurial American economy and community. The changes that will be required to address these new challenges we face will not be simple. The challenges that have led to where we are today are momentous and they require big ideas and solutions. If we employ our American Voice toward a civil discussion we can take on even the most intractable challenges: dramatic and increasing income disparity coupled with an unstoppable tsunami of automation that will continue to disrupt the economy and the jobs of almost every imaginable field of work and endeavor; Increased tribalization within the American community pitting rich against poor, Democrat against Republican, urban against rural. You will not be surprised, from someone who proudly claims to be a “Radical Centrist,” that I believe one reason for this is the extremists in both political parties who have declared war on their centrists. Part of the case I intend to make over the next few weeks is a case for strengthening voting rights and watering down the power of political parties. I also intend to make the case for National Service. It was Gandhi who said “The best way to find yourself is to lose yourself in the service of others.” These words reflect what many others have said . . . that the greatest beneficiary of public service is the person who serves, not the person served. Service creates a touchstone we share with one another. It takes us out of ourselves and puts us into the shoes of others. National service – either civilian or military – should be a legacy requirement of the American journey. For every American it could be a transformational moment in both their personal journey and our collective one. The benefits of national service accrue to both the individuals who serve, those who are served and to the country in whose service the individual labors. There is a power to the nexus of the three; synergies that can have the effect of strengthening the bonds between diverse people, creating a sense of community. Probably most controversial, at first blush, will be the case for a universal basic income. A legacy payment to every American citizen based on contributions to the wealth of our nation made since 1492. You might be surprised at the people who have made the case before me including conservative economist Milton Friedman and Libertarian icons as well as titans of technology who see it as a way to unleash America’s entrepreneurial spirit and to free the middle class and the precariat from the yoke of unnecessary regulation and bureaucracy. This is not to neglect other fundamental aspects of renewing the American idea in a post-Trump world. Education is a core value that will require fundamental change to reflect the world in which we live as is the nexus of science and morality. Let’s take a journey together . . . Americans all.